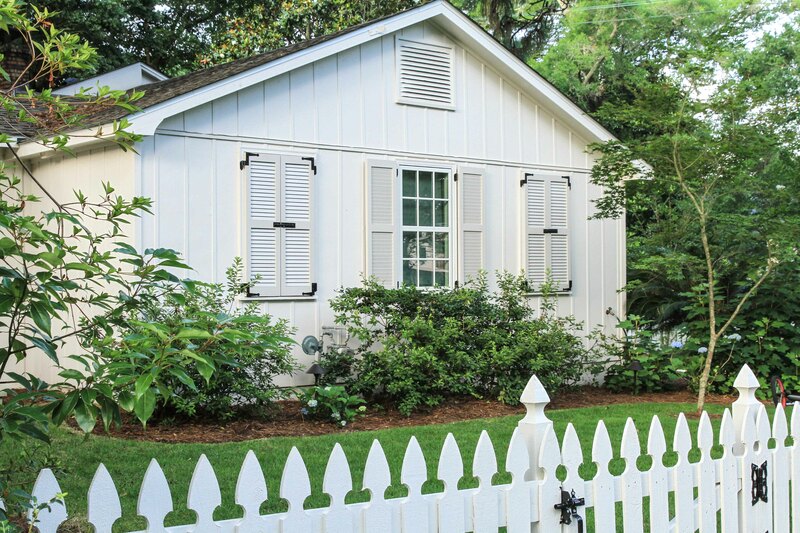 Once upon a time, exterior shutters were all that kept the elements out and the heat in. When glass was more expensive than the average person could afford, wooden window shutters were more practical than necessarily attractive. These days, most windows are glass and shutters are often just a decorative element in the home. The most appealing looking shutters are those that might still be functional – in other words, shutters that sit on either side of a window could and actually close and meet in the middle. Unfortunately, this is not often the actual case and the resulting look of a too narrow shutter is a little cheap looking – not the image you want when selling your home! However, a well thought-out shutter in either wood or a quality vinyl will add to the curb appeal and the ultimate value of your home. This traditional raised panel shutter has a naturalist wood grain, but is made from durable composite material that is warranted against cracking, peeling, rotting or flaking. Depending on the local climate, a composite or vinyl shutter provides excellent durability over a painted wooden shutter, which needs periodic repainting. The raised panel style is a very formal and traditional look that is sure to raise the style level on any home’s exterior. These fixed louver shutters come in 10 different colors and are also paintable for a custom finish. The molded copolymer construction means that the shutters won’t peel and the color won’t scratch off. Traditionally, louver shutters allowed for air flow and filtered light to come in through the window, but also wicked rainwater away from the house as well. These louvers are fixed in position. These traditional raised panel shutters are made from molded copolymer construction, which means that the shutters won’t peel and the color won’t scratch off. The raised panel style is elegant and the shutters come in eighteen different colors or can be painted to match the front door or other exterior trim. The shutters are designed with a deep wood grain to mimic the look of wood, without the added maintenance. This very traditional board and batten style window shutter evokes thoughts of a cottage hidden in the woods or Grandmother’s house. Available in thirteen different lengths, it comes standard at fourteen inches wide. Made of wood grained vinyl, this shutter comes in thirteen accent colors or is paintable to match custom colors of the home’s exteriors. A very “green” way to go with exterior shutters is to visit an architectural salvage lot for a set of shutters that were saved from a house demolition. Usually, the fewer you need, the easier it will be to find a matching set. Salvaged shutters have the unique patina of age and history that can be a charming addition to your home. Additionally, wood shutters are easily restored and repainted as needed. Building your own shutters isn’t as difficult a project and one might think. For the handy weekend warrior with some decent wood working tools, this is a great way to achieve a beautiful custom look without breaking the bank. A simple wooden plank with beautiful hardware could be a striking addition to a country home as a sort of throwback to days gone by. Custom detailing such as cutouts or decorative carvings provide a unique look that will add to the value of the home.